Beatrice Romaine Goddard (1874–1970) was an American painter. Goddard was born in Rome but spent much of her early childhood in and around New York. She attended school in New Jersey, Italy and Switzerland, eventually studying voice in Paris and art in Rome. On June 13th 1903 Goddard married her friend, the homosexual John Ellingham Brooks, an unsuccessful pianist and translator, who was in deep financial difficulty. The bisexual Goddard never revealed exactly why she married him, however it is likely that this was a marriage purely of convenience for the both of them. It afforded Goddard a kind of freedom she would never have as a single woman. Almost immediately the couple began to quarrel, mostly over Goddard’s new appearance. She had decided to cut her hair short and ordered a new wardrobe consisting only of men’s clothing. Her husband would refuse to be seen in public with her when she was dressed in her new attire. The marriage lasted less than a year. After the divorce Goddard kept her married name Brooks, out of personal preference. 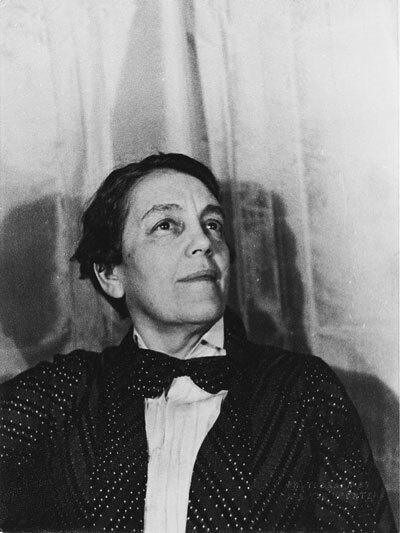 At this time she also dropped her given name Beatrice, and for the rest of her life she would be known as Romaine Brooks. Brooks died in Nice in 1970. See also Radclyffe Hall and Gluck.